A bushing works well for this. No need to mount the router to the jig, just drill a hole the same diameter as the bushing and the router will drop in. You should taper the jig so that the part the router sits in is as big as the base for stability. I’d probably go with a 3/8” OD bushing and a 1/4” straight bit. The offset will be 1/16” so drill your hole for the bushing to account for that. For $10 – this thing works great… and not just for circles. 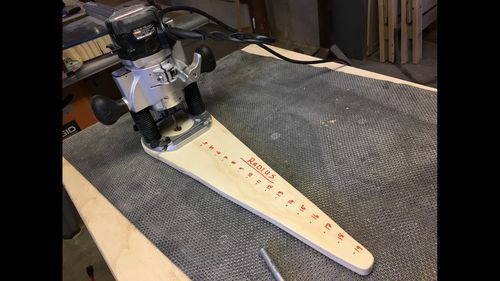 I am a huge DIY jig and tool maker and enjoy crafting them but after making band saw, table saw and router jigs for circles I spent $35 on this Jasper jig. It does 1/16th” increments from 2-1/4 to 18-3/16-inches in diameter and it will even do inlays of the circles it cuts which is really cool and it’s effortless and deadly accurate. Comes with everything you need. I understand if you want to build it yourself too. That’s always fun. There are too many to count on youtube but none I could find that were as accurate as the Jasper. Use the pre drilled holes for your brand router base, stick the pin in the right hole and cut. 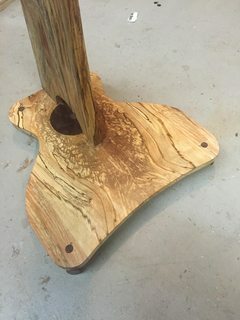 Took a run at making this bookmatched guitar stand base shaped like a guitar. Took 15 minutes to cut the hole then cut the walnut insert and tap it in. I don’t work for Jasper but I love the tool. When someone mentions a circle cutting jig using a router, obviously different people get different visions popping into their head. The image that popped into my head was something similar to this one, only using a bushing rather than mounting the router to the jig. Any of these will work. Some better than others. If you want something ready-made to be able to cut just about any diameter, go with Andy’s suggestion. 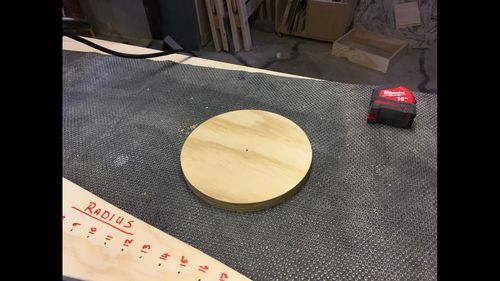 If you want something that will help with circles as well as to use as an edge guide for mortises, etc, go with Brad’s suggestion. If you want to make it yourself, I gave some ideas, but there are countless other concepts that would work as well, or maybe better. You didn’t mention which size bit you are using. If you used a 1/4” straight bit for example, the 1/8” error may be caused by measuring from the center of the bit rather than the cutting edge of the bit when you laid out the 1” increments for the guide pin holes. When I have needed to do this (see my 2 mirror projects), I always just use a scrap of 1/4 or 1/2” plywood, mount the router to it with the bit I am going to use and then measure the radius I want from the edge of the bit and drill a hole that is slightly smaller than than the nail I will use as the center pin to make sure there is no play. BTW with this approach, you can cut any diameter, not just even ones. Note: if you are cutting a hole you measure from the far side of the bit. If cutting a disk, you measure from the near side of the bit. You didn t mention which size bit you are using. If you used a 1/4” straight bit for example, the 1/8” error may be caused by measuring from the center of the bit rather than the cutting edge of the bit when you laid out the 1” increments for the guide pin holes. When I have needed to do this (see my 2 mirror projects), I always just use a scrap of 1/4 or 1/2” plywood, mount the router to it with the bit I am going to use and then measure the radius I want from the edge of the bit and drill a hole that is slightly smaller than than the nail I will use as the center pin to make sure there is no play. BTW with this approach, you can cut any diameter, not just even ones. Which router to use is always a tough question. For smaller sized work the palm sized ones are great because they are small and lightweight. On the other hand the larger routers obviously have more power and can take larger bits. My question would be what type of work do you generally want to use this for? Smaller work = palm router. Larger work larger router. I use more of a tiered approach to this. 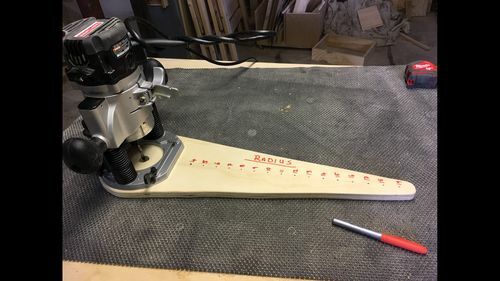 For just a basic circle up to 27” I have the bandsaw jig. 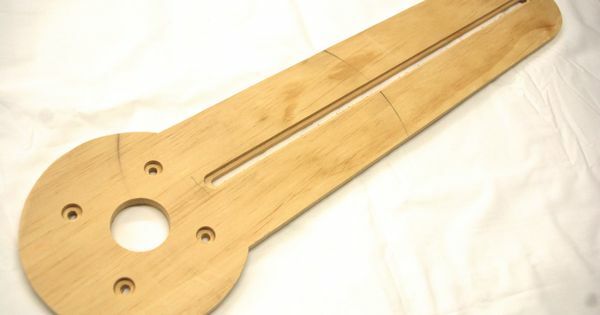 http://lumberjocks.com/projects/299322 This is pretty accurate through the range of the jig and gives a nice smooth edge. If I want a rounded edge I take it to the router table after making the circle and finish it off. For a more exact perfect dimension I would finish it off on the lathe. If this is something in the field then I have a ready made circle cutting jig that I made to fit both the palm and larger router. True this takes more steps but I have the time and the jigs are made so easy to set up and use. With the broad range of projects I do a one sized fits all approach was limiting. Something to consider for everyone no matter what the jig you make may be. While building it keep in mind it needs a home. Whether it be a hook on the wall or a box incorporate this into your design. It doesn’t do any good to make one and then jam it into a corner somewhere and it gets damaged or forgotten when needed the most.